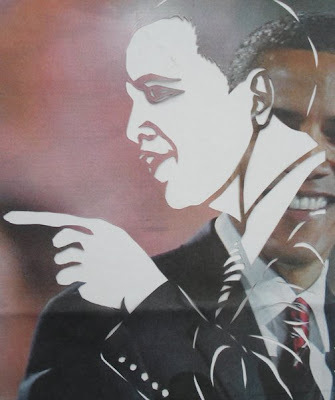 A newspaper cut out on the reverse side of the next paper cut. 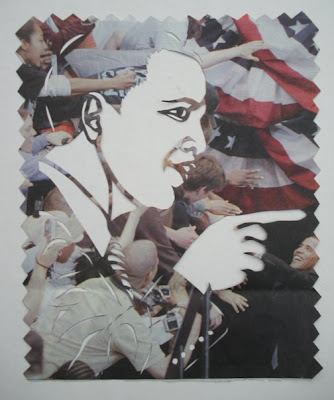 Newspaper cuttings of Obama, on reverse sides, with completely different effects. 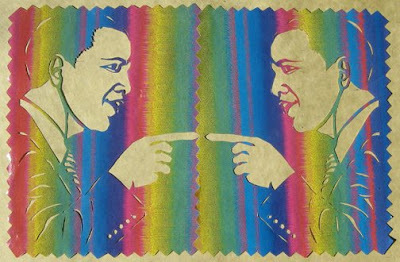 "Obamamos", Barak Obama, cut from serape colored paper. 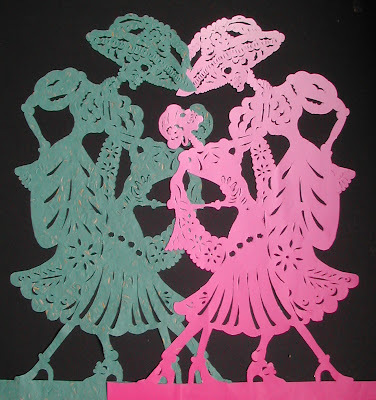 Learn about the art of papel picado at the historic San Pedro Library, Monday, Nov. 17th, 6 PM. 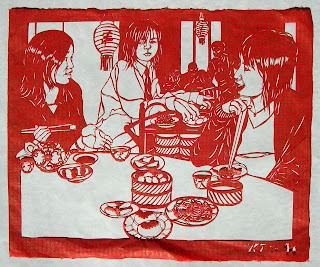 Create your own cut paper banner and take home to share with others. For more information, call 210-733-1454. 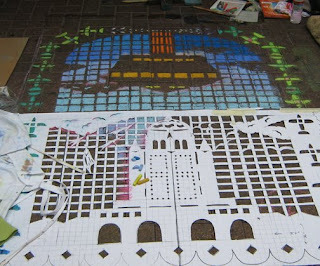 Kathleen's papel picado workshop at the historic San Pedro Libray. Learning to cut tissue paper banners in the shape of three flying seagulls. 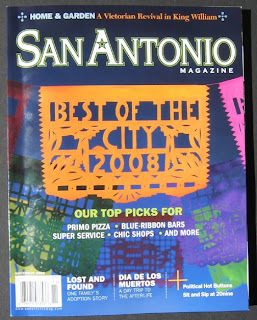 Inside the magazine, you'll see a feature on the Best of San Antonio restaurants, art, shopping, etc. 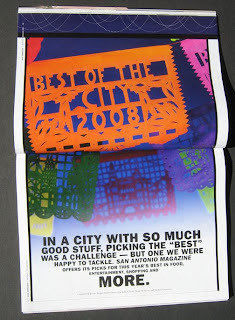 Here's the cover and feature page from the San Antonio Magazine's Best of the City, 2008 edition. 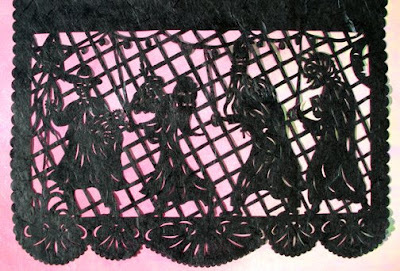 I designed the papel picado. Please see my web site, to brouse for more art work, or order portraits, decorations and gifts, all original and hand made by yours truly, from my on line store at cut-it-out. org. Lovely la catrina, made the scene at the Day of the dead procession. Doesn't she just get younger and younger? Day of the Dead procession on S. Alamo St. 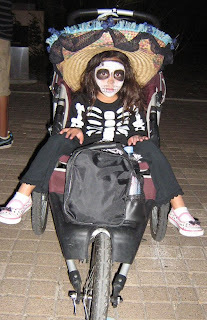 This little calavera bicyclist was one of many who celebrated life and death along South Alamo on Nov. 2nd. 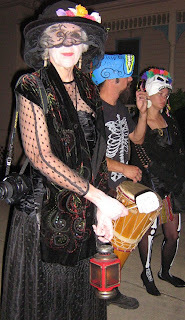 This year's was the 12th procession in row, lead and organized by educator/artist, Terry Ibanez, who always dresses in calavera, and inspires with her poetry and wisdom. This was a fun event at the Olmos Park Bharmacy. 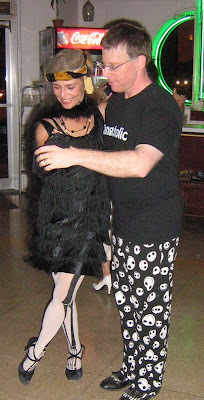 Terry teaches tango in San Antonio, and brings in some great teachers for workshops. The Bharmacy is hosting free tango milongas every Tuesday through November from 7-10 PM. Open to all! So come on down. 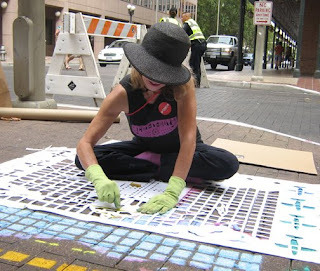 Hi, friends, here is the final product from my stencil chalk art project on Houston in St. San Antonio. 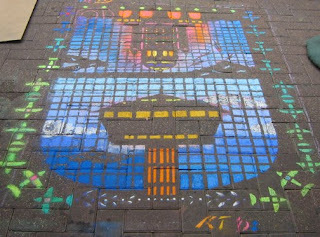 It is an extension of my airport stencil art project earlier this year. Here you see the Hemisfair tower and the "Taj Mahal" at Randolph Air Force Base. It was a fun event. I hope to do it again, and better! 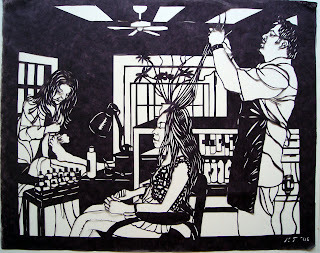 Ricky Armendariz, from UTSA, has curated an exhibit of diverse works, including four paper cuts by Kathleen, on view from Oct. 2 to 26, 2008 at the UTSA Satelite Space in the Blue Star Art Complex in King William, San Antonio. Gallery hours are friday thru sunday, 12-6PM or by appointment. Let me know what you think.